Murals: Creating a Legacy – ¡Murales Rebeldes! 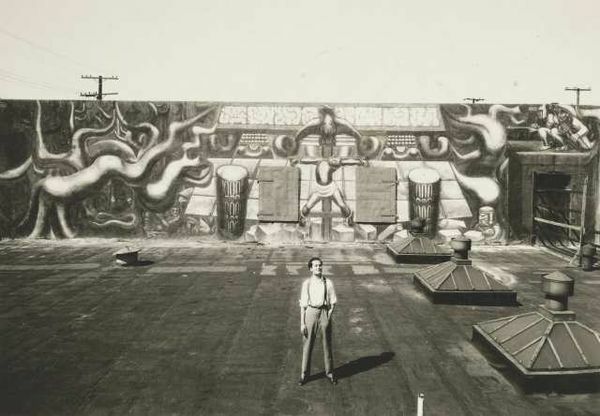 David Alfaro Siqueiros observes the whitewashing of his controversial mural América Tropical (1932) in a detail from Barbara Carrasco’s censored mural, L.A. History: A Mexican Perspective (1981). Courtesy LA Plaza de Cultura y Artes and California Historical Society; photo: Sean Meredith. 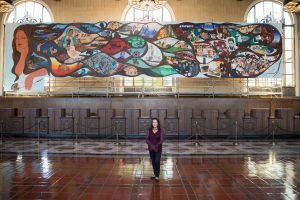 There was a time in 1932 when patrons at the rooftop beer garden of the Italian Hall on Mexican-themed Olvera Street could admire an 80 x 18-foot mural painted on the building’s exterior second-story wall. When visitors to this newly opened Mexican outdoor marketplace could look up from the street and see part of the mural. When Los Angeles could claim the country’s first large-scale mural on an ordinary wall in a public place. But the moment was brief. By 1934, América Tropical, created by the famed Mexican muralist David Alfaro Siqueiros, was completely whitewashed—rejected by those offended and shocked by its political statement against American imperialism, rather than the benign ode to “tropical America” they expected. The contested section depicted an indigenous Mexican peasant tied to a double cross beneath an American eagle (a symbol of American imperialism). Siqueiros, in fact, titled the mural América Tropical: Oprimida y Destrozada por los Imperialismos (Tropical America: Oppressed and Destroyed by Imperialism). Roberto Berdecio, a close associate of Siqueiros, stands in front of América Tropical shortly after completion in the 1930s. Mural: © 2012 Artists Rights Society (ARS), New York/SOMAAP, Mexico City; courtesy, Getty Research Institute, Los Angeles, http://www.getty.edu/conservation. Colored digital rendering of David Alfaro Siqueiros’s América Tropical. Mural: © 2012 Artists Rights Society (ARS), New York/SOMAAP, Mexico City; courtesy Luis C. Garza. As the whitewash peeled off in the 1960s and 1970s, a “ghost” image of the mural was revealed. It is this “ghost mural” that the Getty Conservation Institute (GCI), in partnership with El Pueblo de Los Angeles Historical Monument, has been conserving since 1990. And it is the meticulous work of cleaning the mural that conservators addressed this month, nearly 85 years since the mural was painted. A conservator at work on the conservation of América Tropical at El Pueblo de Los Angeles National Monument, March 21, 2017. Mural: © 2012 Artists Rights Society (ARS), New York/SOMAAP, Mexico City; photo: Shelly Kale. While the country overcame significant challenges in the years following the whitewashing of América Tropical—a devastating Depression, a world war—the fight for the civil rights of minorities simmered. 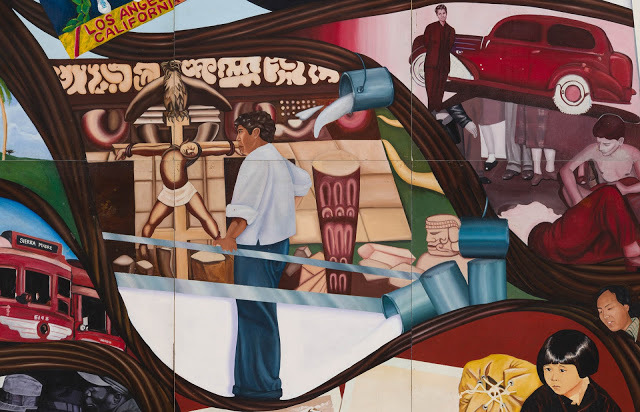 As Siqueiros’s mural “reappeared,” nationwide protests erupted, culminating in the social and political movements of the 1960s and 1970s, including the civil rights Chicano Movement. 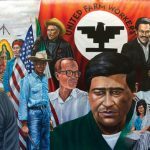 In the Los Angeles region, Chicana/o muralists stepped into the public fray, becoming a primary vehicle of the movement’s message. But while valued by the communities they served, the fates of many of the murals they painted echoed Siqueiros’s experience decades earlier. 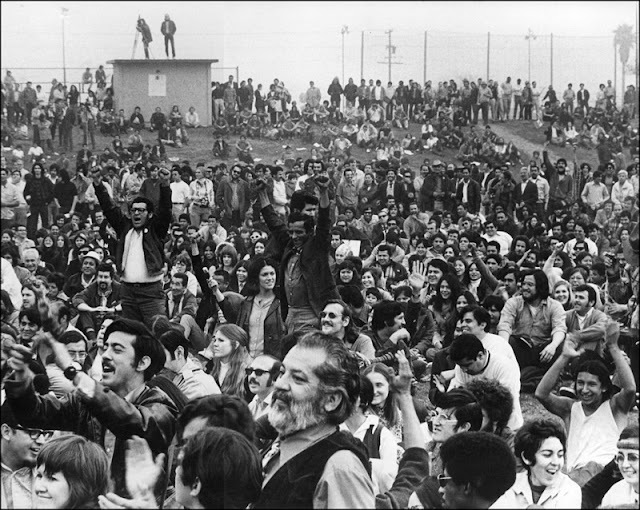 Chicano Moratorium (Mexican American anti-Vietnam War movement), Los Angeles, 1970. Courtesy Oscar R. Castillo; photo: © Oscar Castillo. Addressing these outcomes and the larger role murals play in public discourse and artistic contribution are the forthcoming publication and exhibition ¡Murales Rebeldes! 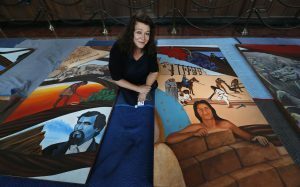 L.A. Chicana/o Murals under Siege, developed by the California Historical Society and LA Plaza de Cultura y Artes. Celebrating the work of seven muralists whose works were censored, whitewashed, neglected, and even destroyed from the 1970s to the 1990s, ¡Murales Rebeldes! examines these murals in the political, legal, and social climates of their time and raises important questions about how to understand and secure the legacy of murals as public art. 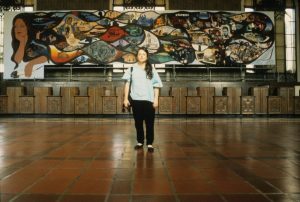 One muralist, Barbara Carrasco, saw parallels between her 1981 mural L.A. History: A Mexican Perspective and América Tropical. 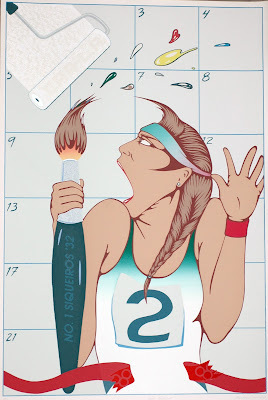 Both murals were censored—due to their “controversial” political and historical content—in years when Los Angeles hosted or was preparing to host national and international visitors to the city’s Olympics (the 1932 and 1984 Olympiads). 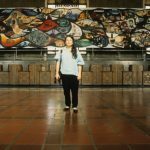 Barbara Carrasco, L.A. History: A Mexican Perspective, 2017. Courtesy LA Plaza de Cultura y Artes/CHS; photo: Sean Meredith. Barbara Carrasco, Self-Portrait, 1984. Courtesy of the artist; © Barbara Carrasco. Like Siqueiros’s América Tropical, the murals featured in ¡Murales Rebeldes! endured a lack of recognition—as works of art, as acts of personal expression, and as voices with social, historical, or political relevance. Some of the ¡Murales Rebeldes! muralists, such as Ernesto de la Loza and Willie Herrón III, conserve their own and others’ murals. ¡Murales Rebeldes! not only recounts the time, place, and conditions under which the murals it features were created, but celebrates the artistic and personal contributions of these murals and muralists to public art and the historical record.